For an instant escape to paradise, save yourself the expense of plane tickets, hotels stays and paying the tab at the bar. Instead transform your home to that tropical escape you've been dreaming of and enjoy an island get-away feeling by simply walking out the back door. By creating a tiki bar in your backyard, your far-away beachside bar is there just when you need it! You can easily create a tiki bar of your own. The fun is in the details and decoration, so don't hold back when designing your own tiki bar paradise. Colorful, nature-inspired decorations and soft lighting creating a island-inspired vibe that encourages you and your party guests to unwind. Here are some tips for creating your very own tiki bar. First things first - you'll need to get the bar itself. If you're feeling adventurous and are good with a hammer - or are looking for a fun weekend project - you can build your very own tiki bar from scratch. There are many step-by-step guides online that will lead you through the process of building your own tiki bar. If you're looking for a faster route to tiki-bar relaxation, then you can buy a pre-made bar and simply install it on your patio or in your backyard. You can begin with a pre-fab base and then add decorations and other personal touches to make your tiki bar truly your own. When you think of tiki bars, you probably think of torch-lit drinking spots situated on a sandy beach. You can set up your tiki bar in an empty corner of your backyard, or can place it on your patio or deck for easy access. However, your tiki bar doesn't have to be located outside. If you don't have a backyard or patio, or just want to put the bar somewhere where you can enjoy the AC and grab a drink rain or shine, you can put your tiki bar in a finished basement or spare room. Your friends and family will love coming over to enjoy the bar - and you'll love having it right in the other room! No tiki bar is complete without some fun decorations. Raffia garlands are a must - you can buy them at party stores or order them online. Hang them from the edge of the counter and from the roof of your tiki bar, if it has one. The more raffia, the better! You can staple-gun the raffia garlands to the bar or, if they're light, adhere them with a glue gun or tacks. Garlands made of colorful, tropical flowers or seashells are also great picks for decorating your tiki bar. Placing green potted plants and mini-palm trees around the tiki bar also create a fun tropical ambiance and make your tiki bar look extra authentic, even if you're miles from the shore! Sometimes, all you want to do is enjoy a frozen concoction while kicking back in a comfy chair. For a classic look, you can place raffia-lined stools in front of your bar. But make sure you have other seating options available for friends who drop over to relax. Adjustable lounge chairs are great options, and if you want to really embrace the tropical theme, you can hang a hammock or two for lounging in. If your tiki bar is located outside, you can also set up soft blankets and large cushions to create a comfortable nook to unwind in and enjoy your frozen concoctions. Enjoy an island escape right in your own backyard! It's essential that you can still enjoy your tiki bar after the sun goes down, and that your tiki bar has a relaxed mood, so take care to choose the right lighting for your space. If your tiki bar is outside and it is safely located far enough away from trees, shrubs and electrical wires, then tiki torches are a must. You can light them after dark to keep the party going all night and create a warm, cozy atmosphere. String lights are also fantastic lighting options - choose white for a soft, classic look and colored lights for a fun and energetic party feel. Lanterns are also a must for tiki bars - hanging ones add extra ambiance, while you can also place large stand-alone lanterns around the space for ample lighting. 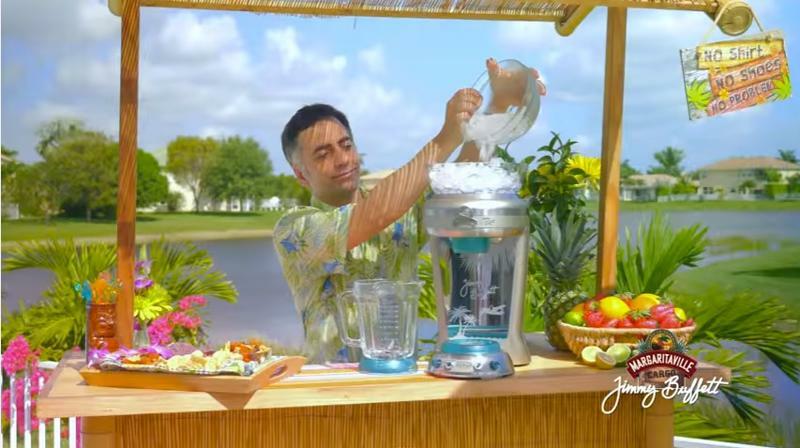 No tiki bar is complete without the star of the show: your Margaritaville® Frozen Concoction Maker®. Having your Frozen Concoction Maker® instantly and easily accessible ensures that you can serve up delicious frozen concoctions anytime, whether for you or your friends and family. Also have a selection of glassware, garnishes, liqueurs and alcohol placed nearby for easy access when it's party time. Don't forget to have a cooler full of ice available so you can mix delicious frozen drinks in an instant. Make sure to add some of your own personality to your tiki bar as well. A great way to do this is by giving your tiki bar a unique name with special meaning and then hanging a hand-painted sign with the name on the bar itself. This will put a personal touch on your very own island escape that's sure to attract a stream of friends that come by to toast that "Five O-Clock Somewhere" kind of time.